The WED Guild® is an elite group of highly trained professionals who are committed to delivering the best quality Music (whether they be a Band or a DJ) and Master of Ceremonies services for their clients. Every WED Guild® member has earned their place by going through a rigorous application process verifying the caliber of services they are currently providing. Others may falsely lay claim to being a “Wedding Entertainment Director®” by using the title in their marketing materials and on their web sites, but if they are not currently listed among our members, they have not truly earned the title for themselves. The guests pictured above are smiling and you can be certain yours will be too, if you should choose to hire a Wedding Entertainment Director® for your reception’s entertainment needs. 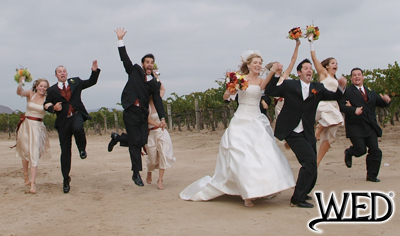 Wedding Entertainment Directors® are quickly becoming the favorite choice of Brides and Grooms who want their guests to laugh, enjoy themselves, and have an unforgettably fun celebration! If you would prefer a wedding reception that will be predictable, mundane, or run-of-the-mill, there are plenty of average wedding DJs and typical wedding Bands that can fit the bill nicely. However, if your ideal reception would be best described as fun, memorable, classy, exciting, and entertaining…then you might just be looking for a Wedding Entertainment Director®.